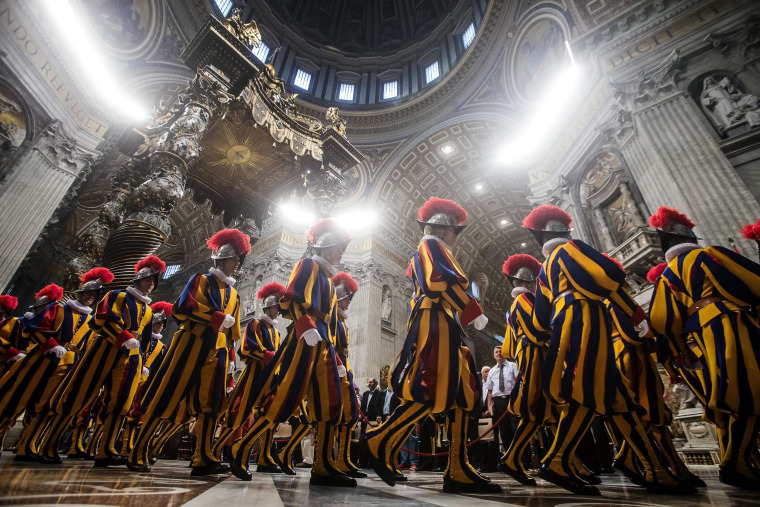 New papal elite Swiss guards in their ceremonial uniforms arrive for a mass celebrated by Vatican State Secretary cardinal Pietro Parolin in Saint Peter's Basilica, on Tuesday. The Swiss Guard, founded in 1506, consists of 100 volunteers who must be of Swiss nationality, Catholic, single, at least 5 feet 7 inches tall and without a beard. New recruits are sworn in every year on May 6 to commemorate the day where 147 Swiss soldiers died defending the Pope during an attack on Rome in 1527.